In April of 1933, August A. Busch, the owner of the Anheuser-Busch Brewery, received a gift from his two sons to celebrate the end of Prohibition: six Clydesdale horses and a wagon big enough to haul barrels of beer. Always an astute businessman, Busch saw the gift as a marketing opportunity. 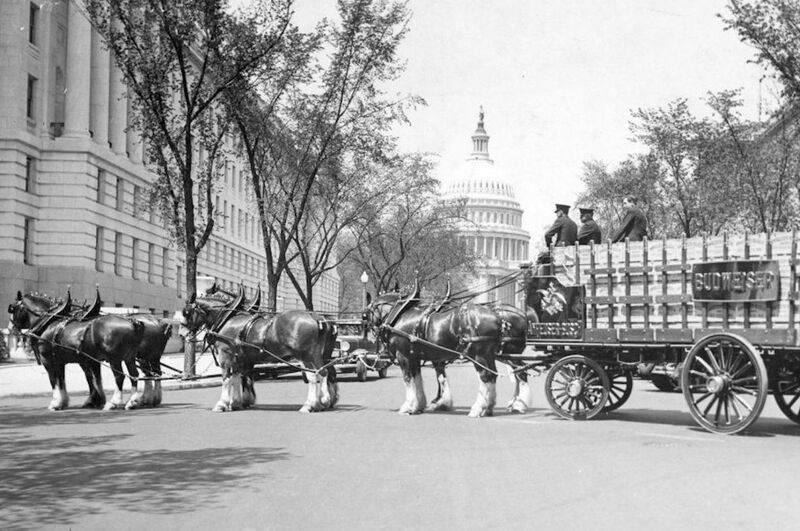 He ordered a second set of Clydesdales and sent them to New York City to gallop down the streets of Manhattan and deliver beer to former Governor Alfred E. Smith to thank him for his work in repealing the 18th Amendment. Thus, a symbol was born. Today, the Clydesdales are a major part of the Budweiser brand, and to celebrate the 85th anniversary of the repeal of Prohibition, the horses are coming back to the streets of Manhattan. Budweiser and Jim Beam are partnering to deliver beer by horse to New York City bars on December 5th. Additionally, the brands are encouraging everyone to stop work for a national toast at 5:32 PM, which is the exact minute that the 21st Amendment repealing Prohibition was ratified. It’s not an exact replication of the first ride. For one thing, the 1933 tour was started to celebrate the Cullen-Harrison Act, which legalized 3.2 percent ABV beer on April 7th. December 5th is the day that all of Prohibition was repealed, including liquor. But without that last part, Jim Beam wouldn’t be able to join in on the fun. Earlier this year, Budweiser and Jim Beam partnered on a beer aged in barrels that used to hold whiskey. The horses are stopping to make deliveries at bars including Hog Pit, Grey Bar, Blacksmith, and Smithfield Hall — essentially, many of the bars in the Flatiron District of New York. That’s not the only Repeal Day celebration going on. New York Distilling Company in Brooklyn is celebrating its seventh year of opening, and The Boogie Woogie Room is throwing a party with burlesque, Champagne fountains, and Redemption Rye cocktails. Outside of the city, Dutch Spirits, a distillery in the Hudson Valley, is reopening for the first time since 1932, when it was raided by the FBI and shut down. This year, celebrate Repeal Day like it’s 1933. And if you can’t make it at that time, well, it’s 5:32 PM somewhere.